Teaching for profit -- say what? 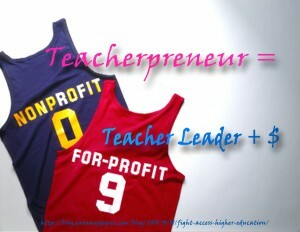 With this graphic, John has done a terrific job of probing the differences between “Teacher Leader” and “Teacherpreneur.” I like money as much as the next person, but I wonder about the “non-profit v. for-profit” dichotomy. Besides, in order to garner “profit,” you have to exploit some resource. What services are we going to cut in order to create this profit? If we insert profit into public education, then the goal becomes more about making money and less about fostering democratic habits of mind and body [& spirit]. Is "for-profit" a model we want for public education? Why not just pay teachers really well for their important, child-rearing endeavors and elevate collaboration, creativity and critical thinking as our aims? I support unions because they are fundamental to a healthy and vibrant democracy. Unions foster individual liberty while ensuring social equality. Unions exist on the "commons" of our lives and stand for the sustainability of collective bargaining, safe and effective working conditions, and justice. The good folks at EDUSolidarity are leading a campaign to support unions. Read about them HERE, and consider showing your support. What's your message about public education? How can we continuously engage the public without sounding like a broken record? 1) Refer to investments in public education as an expression of patriotism. Divestment in funding of education is unpatriotic. 2) Describe smart spending at college (pre-service teaching), district and/or school level so that the ideas get out there. What programs need to be in place to foster love of learning (or "engagement" or "sustained learning")? Inform as you advocate. 1) Stay on message. Public education is about love of life-long learning and civil democratic engagement. Even though it is exhausting, we've got to have everyone rehearse, investigate and explore this #1 assumption. 2) RTTT emphasizes student preparation to "... succeed in college and the workplace and to compete in the global economy." RTTT and other federal, state and local programs should also promote democratic engagement. Public education is an opportunity for students to learn about the infrastructure of democracy. 3) America's economic, political and social prowess depends on creative and critical thinking. Standardized tests do an incomplete job of assessing either. Invest in professional development so that teachers can develop engaging and rigorous curricula that foster both critical and creative thinking. 4) Assess students' growth using a variety of measures, including 8-9 multiple intelligences (MI). Standardized tests incompletely assess verbal & mathematical. Creative and critical thinking has to rely on other domains such as collaboration (interpersonal), time management (temporal -- I think I just invented that MI), and analysis of mistakes/course correction. Failure is an essential ingredient of learning. On this count, high stakes testing measures the wrong things. 5) Develop a rubric with schools, parents, students for "school readiness." What do students need to benefit from a rigorous, engaging (and therefore joyful) curriculum? 6) Assess teachers growth in collaborative "aims" [not "goals"-pet peeve] that are aligned to everything above -- or parts of above because we are not gods -- and bench-marked progress (1/4ly, yearly).